To better understand the Upper Snake River Basin’s landscape, and to inform the development of alternative future scenarios, the INFEWs team has developed various models to represent the region’s many environmental, climatic and social processes. Uncertainties in future climate conditions for the Upper Snake River Basin include more variable precipitation events, decreases in winter snowpack and an increase in regional temperatures. To inform the development of future scenarios, researchers created a model for projecting future climate conditions that incorporates the assemblage of a suite of historical climate forcing at appropriate spatial resolutions using the gridded surface meteorological dataset of Abatzoglou (2013). Future climate scenarios are available from an output of downscaled climate projections for the study area through 2100. INFEWs climate modelers are also evaluating the credibility of other climate models to help capture aspects of surface drought and help identify a more appropriate set of models for future conditions. Abatzoglou, J. T. (2013), Development of gridded surface meteorological data for ecological applications and modelling, Int. J. Climatol., 33(1), 121–131, doi:10.1002/joc.3413. 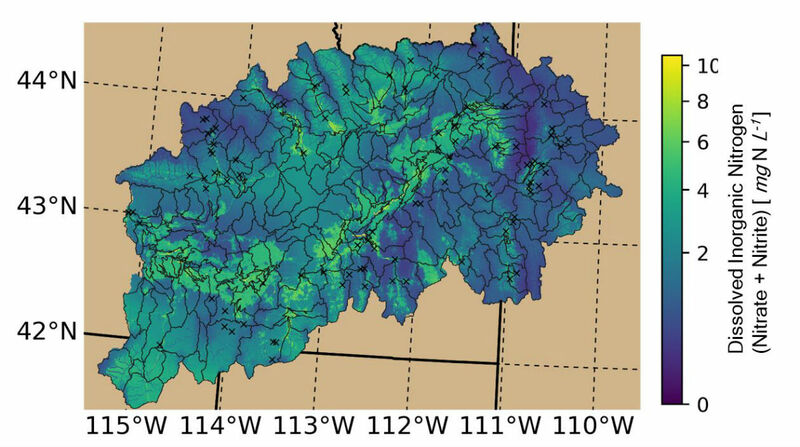 The INFEWs team will use the Water Balance Model (WBM) to simulate the complex hydrological interactions and nutrient flow regime of the Upper Snake River Basin region. The model will include a combination of national scale datasets, including meteorological data, land cover data, population data, waste water treatment data and dam capacity and purpose information. Of all ReFEWS models, this one is the most mature, and recent efforts have focused on a sensitivity analysis of the model under different conditions and projections. The INFEWs team will use the Computational General Equilibrium (CGE) model, due to its ability to incorporate information on the study area’s production, households, trade, government savings and investments and market equilibrium, to determine possible economic outcomes in different environmental, climatic and social future scenarios. A pilot study using this model was conducted to quantify the economic losses from heat stress by the dairy industry in scenarios of future regional climatic changes. Drawing upon data regarding dairy cows from the Idaho State Department of Agriculture and downscaled climate data, the preliminary results indicated that future heat stress impacts could be up to $111 million (2015 USD) in economic losses for the region. The INFEWs team is using the Actor-Resources-Dynamics-Interactions (ARDI) modeling approach to identify key elements and components of the food, energy and water systems of the study area. During stakeholder engagement workshops, use of this model has allowed stakeholders to identify the direct and indirect actors who influence decisions about the use or management of surface and ground water and agricultural/livestock byproducts. They have also identified important dynamics and processes that drive changes in the region’s food, energy and water systems. Use of this model has helped the INFEWs team adjust their perceptions regarding important components within the region’s systems, and has informed the development of other models, including the Agent Based Model. A framework for conducting a Joint Stressor Analysis (JSA) in the Upper Snake River Basin (USRB) has been developed as a tool to create multidisciplinary products from this project. INFEWs team members at the University of New Hampshire have written software components to facilitate this process. Using the USRB as a geospatial platform, the JSA framework can develop a spatial representation of potential threats through inputs of possible threat indices relevant to the area’s complex system interactions of land management, water use, water regulations, waste reuse and energy. This framework provides a tool to explore the possible responses of the system to these different indices. A preliminary list of possible threat indices has been developed and next steps include modifying the list in coordination with stakeholder input and scenario creation. Stressor map for USRB: dissolved inorganic nitrogen (DIN) in soils and river.